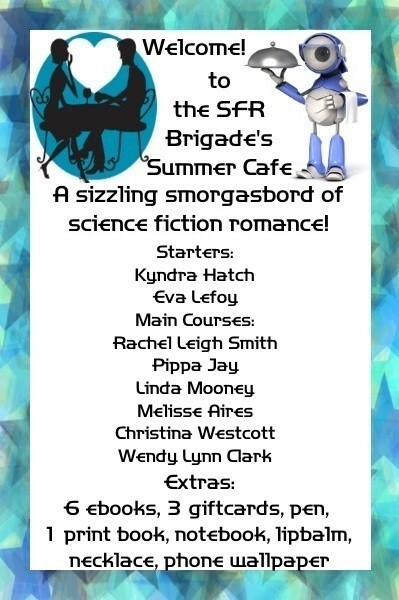 Win free stuff with the SFR Brigade Summer Cafe Blog Hop! My week has passed – June 22nd (Androids and Aliens). I hope you enjoyed learning about pink flamingos and edible hair dye! Meanwhile, there are still other weeks you can visit themed blogs, enter the week’s contests for books + gift cards + swag, and win! “Starters” are short stories and novellas, “Main Courses” are novels, and “Extras” are the things you can win that week. Good luck, and thanks for participating! ‹ Liberation’s Kiss Release Day!